This little restaurant has been right under my nose for ages and I’m ashamed to admit that I only learnt of its existence on Instagram. 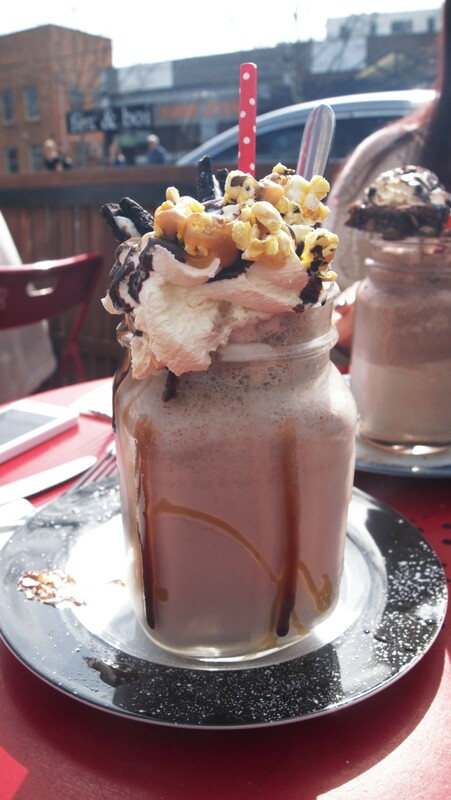 Of late, my Insta feed has been flooded with pictures of these insanely rich, sugar loaded and over the top ‘Freak Shakes’, which is what brought me and what looked like half of Melbourne to Johnny Pump. 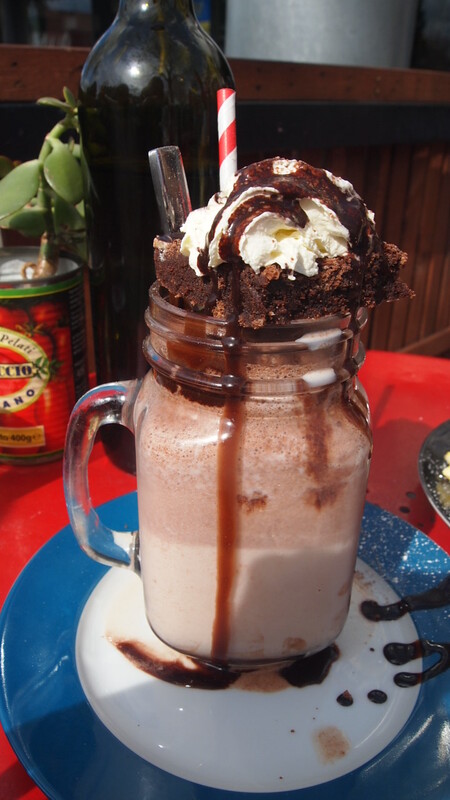 For those who haven’t heard of the latest foodie fad, a Freak Shake is pretty much a flavoured milkshakes topped with a sweet treat like a brownie, a piece of cheesecake or a donut. It’s an excessive, calorie loaded and insanely attractive treat that is enough to tempt even the healthiest of people into having a cheat day. 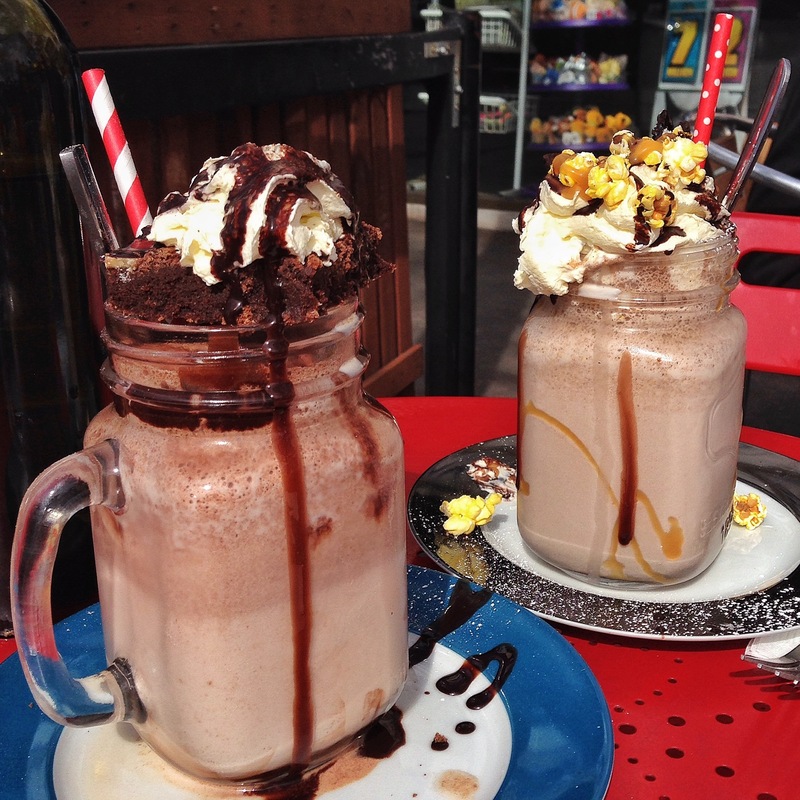 Given it doesn’t take a whole lot to persuade me to have a cheat day (um, it’s pretty much every day), once I realised that an eatery close to home was serving up these shakes I headed straight there to try them for myself. We visited over the weekend and every table was occupied with eager foodies getting their Freak Shake hit. Fortunately for us, a table became available just as we arrived, but others weren’t so lucky, in the time we were there a number of people were turned away purely because there was no where to seat them. I have to admit, the team at Johnny Pump seemed really overwhelmed by the influx of dinners. The service was a bit disorganised and they appeared to be quite flustered. I had a quick discussion with one of them and he mentioned that it had been insanely busy since they introduced the freak shakes, but I’m sure that it’ll get easier as they get used to their new found popularity. So, were the shakes worth all of the fuss? I’d say yes and no. We ordered the nutella and choc fudge brownie shake and the caramel popcorn and oreo shake. Both shakes looked amazing! Lets be honest, most of us eat with our eyes, so purely based on what they look like I absolutely understand why there is so much fuss around them. In terms of flavour, they were both tasty, but the flavour was much more subtle than I expected. I thought we’d get a big hit of nutella and caramel, but that wasn’t the case, if anything it was a bit light on. I’ve enjoyed great shakes at other cafes (like the Golden Gaytime at Hammer and Tong, or the Apple Pie shake at Candied Bakery) and in all cases the flavours were big and bold, so although these shakes were good, I just think that if they’re going to be called a ‘Freak’, the flavour has to be bigger and better than all of the others. But there is more to this place than just Freak Shakes, offering an American influenced menu spanning breakfast, lunch and dinner (big thumbs up as breakfast is served to 3pm), Johnny Pump has something to meet everyone’s tastes. Although I probably consumed my daily calorie intake with the shake, I couldn’t leave here without sampling their food, so I ordered the New York Waffles (with 2 grilled eggs, maple brushed middle bacon, apple roasted tomato, whipped cinnamon butter on a waffle) and my sister ordered the risotto with free range chicken (pot roasted button mushrooms, wild thyme and grana). For the most part the waffles were good, but they weren’t quite what I expected. I envisioned a couple a fluffy home made waffles, topped with delicious maple glazed bacon and a couple of eggs, accompanied my some creamy cinnamon butter. 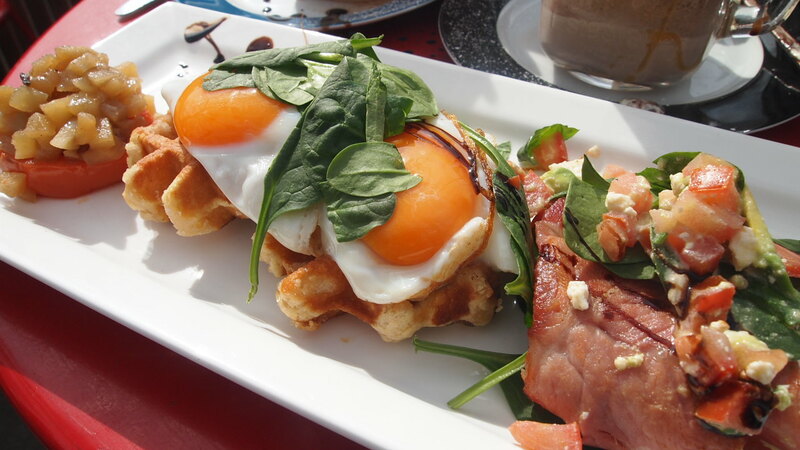 What I actually got were a couple of store brought waffles topped with fried eggs, served with a side of bacon which was topped with lots of baby spinach and an avocado, feta and tomato salsa. Then if that wasn’t enough, there was also a grilled tomato topped with cinnamon poached apple. The whole dish seemed very confused to me, there were so many different elements on the plate that didn’t really go together. It was trying to be too many things and if they simplified it a little bit (I’d do away with the baby spinach and salsa), this dish would be 100 times better. 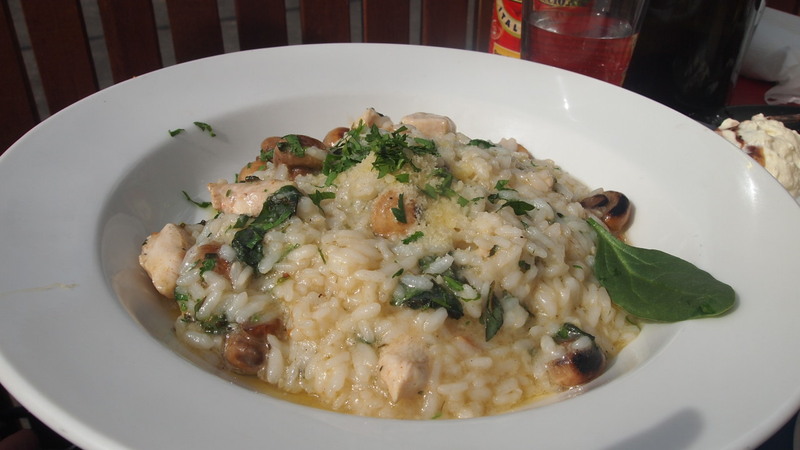 My sister really enjoyed her risotto, she said it was packed full of flavour and cooked really well. With a little bit of refinement, Johnny Pump has the potential to be a great café, so if you’re in the area, stop in for a Freak Shake and support a local.